Figure 1 VERYONE HAS the responsibility to cultivate an informed aesthetic. Just as an informed conscience is built on the natural law written on our hearts, an informed aesthetic should be built on the natural aesthetic we are born with. Certainly we can agree that a sunset is beautiful, but only an intelligent appreciation for craftsmanship and poetry will allow us to judge whether the painting of a sunset is beautiful. Alice von Hildebrand wrote in the latest issue of Latin Mass Magazine (“Dietrich von Hildebrand Unified by Truth, Goodness, and Beauty Part II,” Vol. 22, No. 3, Fall 2013), “How right Plato was when he said that a child exposed to beauty will, later in life, instinctively reject anything ugly or vulgar.” We must surround our children and ourselves with beauty so that we may have an ordered response to the world around us. According to 19th century art critic John Ruskin, “He who has followed up these natural laws of aversion and desire, rendering them more and more authoritative by constant obedience, so as to derive pleasure always from that which God originally intended should give him pleasure, and who derives the greatest possible sum of pleasure from any given object, is a man of taste.” In other words, it is to our own benefit that we cultivate an appreciation for art. The joy derived from encountering the visual arts becomes deeper and more nuanced as we grow. It is especially important for Catholics become fluent in art because it is a universal language of the Church, subordinate only to Latin. The symbolism of various colors and motifs is remarkably consistent over the history of the Church yet endlessly fascinating because it is embellished by every culture and every epoch touched by the Gospel. Reflect upon the symbol of the goldfinch. Because it eats thistle seeds, it is traditionally associated with Christ’s passion. Raphael placed this small bird in the hands of St. John the Baptist and the Christ child in his painting Madonna of the Goldfinch (figure 1). Via this poetic device, the viewer can intimate the love that Christ has for His cousin, and by extension all of humanity, as He willingly reaches for the suffering that is offered to Him. Mary places a gentle hand on St. John’s plump shoulder as the exchange takes place. It is with her patience and resignation that we must embrace our own sufferings. Without an understanding of the meaning of the goldfinch, the painting is reduced to a charming yet superficial group of figures in a landscape. Figure 3 — Click to Enlarge THE ARTIST DOES NOT simply take a snapshot of the physical world. Instead, he acts as a lens through which the eye is focused. Let us consider one of the most important metaphors within all of art: light. Analyzed and discussed by both physicists and theologians, the problem is left to artists to bring the physical and spiritual worlds together. Rogier van der Weyden understood the importance of light. This master of the Northern Renaissance created paintings that glow like jewels. This is due to the fact that he painstakingly applied layer after layer of transparent glazes. 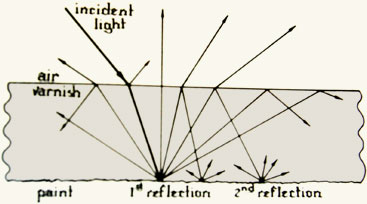 If we examine a ray diagram (figure 2), it is evident that a transparent layer of varnish effectively “captures” an angled ray of light and compels it to strike the paint surface again and again, thus heightening the effect of illumination on the surface of the painting. Van der Weyden’s love of light was not only limited to his meticulous technique. He also showed his affection for and understanding of light in the details he represented. Each and every tear wept by those at the foot of the cross includes a reflection, a cast shadow, and even the light refracted within (figures 3 and 4). I think that it is only after appreciating the physical properties of light that we can understand it within the context of supernatural metaphor. In its broadest sense, it is only by divine illumination that beauty can be perceived. Anyone who creates or considers art must always have the words of Christ before him, “I am the light of the world: he that followeth me, walketh not in darkness, but shall have the light of life” (John 8:12). Figure 4 — Click to Enlarge When I ask people for their opinion on a particular work of art, I often hear the response, “I’m not really an artsy person.” Most people don’t feel “qualified” to give their opinion on artistic merit. I wonder if this avoidant answer is due to the fact that our modern world glories in specialization. By middle school, most children have self-identified as “bookish” or “athletic” or “a math person.” The problem with embracing such a narrow label is that it gives the individual permission to be perfectly ignorant of everything beyond his chosen scope. It is a stance that is both simplistic and lacking in balance in our complex world. Anyone can learn the basics of art history and art theory which provide the groundwork for an informed aesthetic. To begin developing a formed aesthetic immediately, go to your local library and check out one art book. Visit an art museum on a free day. Pause for a moment at a particularly lovely illustration in your missal. Just as beauty of Gregorian chant reveals itself neume by neume, the enchantment of art reveals itself picture by picture. If we allow the power of beauty to penetrate our hearts, God knows what we will begin to see.